This recipe for Slow Cooker Maple Ham and Sweet Potatoes is incredibly easy and quick to prepare! 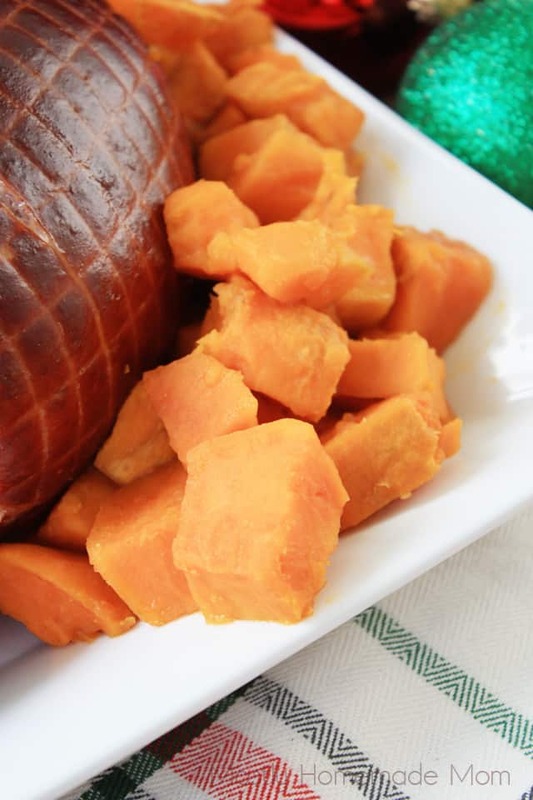 Plus, the delicious ham and side-dish sweet potatoes all cook in the same Crockpot! I’m really not sure why, but I know we all stress out over preparing the main dish at a big gathering. Will it be done in time? Will it be hot when everyone’s ready to eat? Will I even have the time to prepare the recipe in the middle of all the other tasks I have to do? I can report all these concerns because I’ve been there! 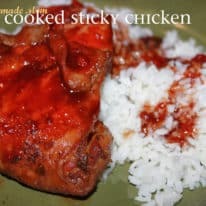 It’s definitely a lot of pressure cooking the main meal for a big family or friends get-together. I can honestly say, I’ve never had an easier time cooking the main dish for a crowd than with this Slow Cooker Maple Ham & Sweet Potatoes recipe. Not only is it just three ingredients (ham, sweet potatoes, and maple syrup), but the side dish cooks right along with the ham. If you have more side dishes and/or desserts to prepare, you have the whole oven freed up to be used. What if you have to transport the ham when another family member or friend is hosting the dinner? Just leave the slow cooker on the “keep warm” setting, pack the whole thing up in the car, and plug it in on “keep warm” at your final destination. This is a dinner I’ll be keeping on hand for the busy holiday weeks ahead. When the ham is done, I like to remove it and slice the whole thing, and then put it back in the slow cooker. That way whenever various family members arrive home from their activities, they have a delicious hot meal waiting for them. Easy peasy! 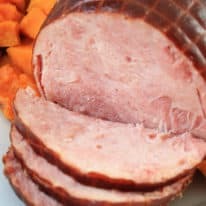 This recipe for Slow Cooker Maple Ham and Sweet Potatoes is incredibly easy and quick to prepare! 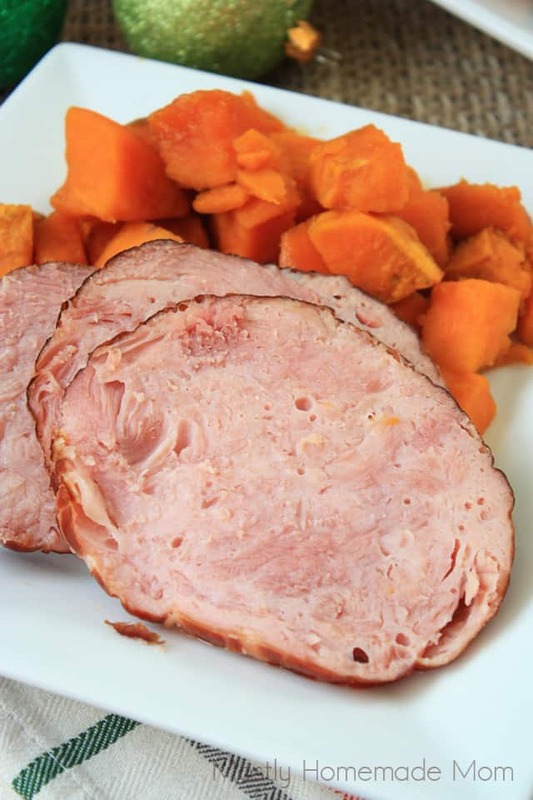 Plus the delicious ham and side-dish sweet potatoes all cook in the same Crockpot! Peel the sweet potatoes and cut into 2-inch pieces. Place in the bottom of the slow cooker. Remove ham from packaging and netting. 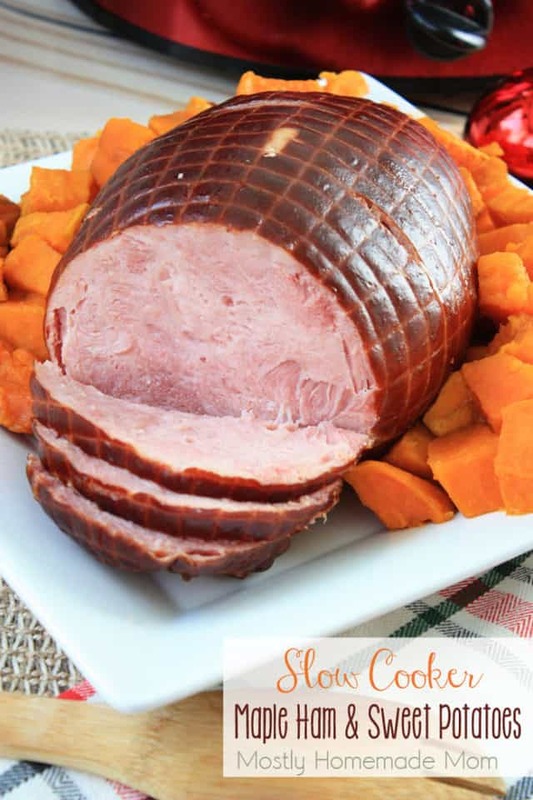 Place ham over top of sweet potatoes, arranging some sweet potatoes around the sides of the ham as necessary to fit. Pour maple syrup over ham. Cover and cook on high for 4 hours or on low for 6 - 7 hours. Slice and serve immediately. Refrigerate leftovers. Diced up ham mixed into macaroni and cheese changes up the flavor in an amazing way! Thin slices or cubes of leftover ham is wonderful with sliced hardboiled egg for a homemade cobb salad! Honestly, the ideas are endless, but these are just starting points to get you inspired. 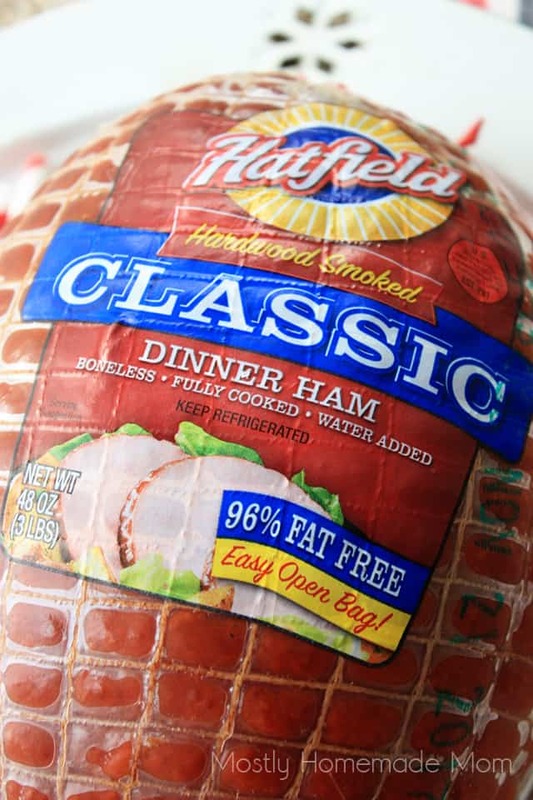 Hatfield Boneless Ham has been a holiday mainstay in our family for years! Hatfield brand is high-quality, American-made, family-owned company and one of Pennsylvania’s heritage brands. Hatfield provides ethically raised products that contain no hormones or steroids added. They are all about keeping things simple and stress free in the kitchen! I personally love their emphasis on sharing meals around the table, or wherever you are, with your family. Especially during the holiday season coming up! Click here to discover where in your area you can find Hatfield products. 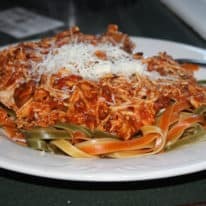 Be sure to check out Hatfield’s recipe channel for many more ideas as well. 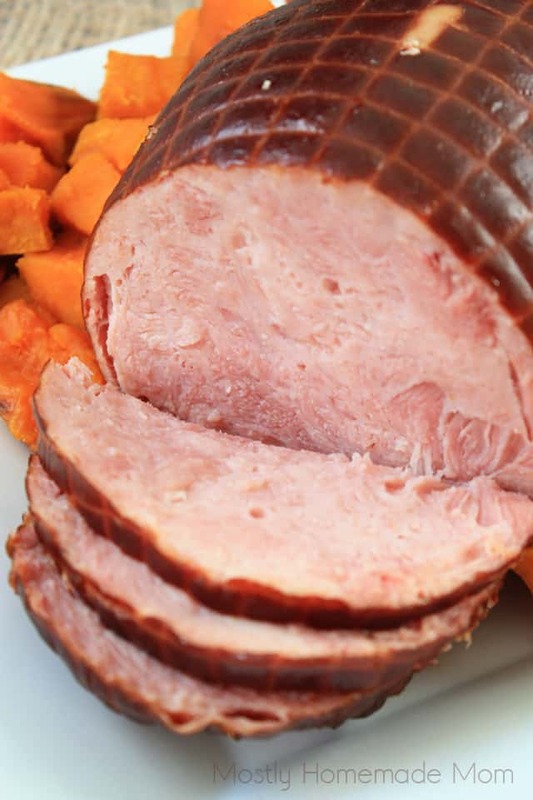 Do you have a family favorite ham recipe? I’d love to hear about it in the comment section below!